One of the fondest memories I have of my boyhood involves a day-trip that I took with my mom and grandparents to a picnic area in the Smoky Mountains. I was five or seven and I remember that we had stopped and gotten a bucket of my favorite meal at the time, Kentucky Fried Chicken. As my mom, grandma, and grandpa busied themselves with setting up a canopy to eat under, I sat at the wooden picnic table that was there and helped myself to a fat chicken leg. As I was eating, a black bear came out of the woods, sat down beside me, and began eating the rest of the chicken. This caused me no great concern because I already had my chicken in hand, and he seemed most content to eat his and leave me be. The same cannot be said of grandpa however, and after the normal routine of feinting, whistling, and hand-clapping that accompanies such instances, grandpa whisked me away and to the relative safety of the car. To the best of my memory, the bear seemed rather nonplussed by it all. While the experts mostly agree that you need to be very cautious when in bear country, the fact of the matter is that if you are on a military surplus tent adventure in bear country, there are certain things you can do to make it as safe an endeavor as possible. 1. GATHER YOUR FOOD. And then cache it somewhere away from your camping site. Bears have a great sense of smell and they will find it wherever it is. That's why the car isn't the best place for food to be stored. Bears know nothing of juvenile delinquency and they WILL tear hell out of your car to get it.Hanging it from a tree is effective. 2. GET BEARSPRAY.You can do this in two ways; you can get bear OC, a chemical irritant, or you can milk a skunk for his "juice" and put it in a spray bottle. I don't recommend the later, as I have only known one person in my life who was able to stand the funk and that was the old Wildman himself. 3. GET A GUN BIG ENOUGH TO DO THE JOB. 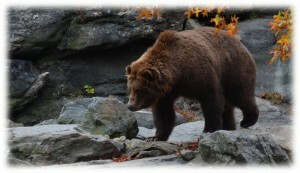 Though killing a bear should be a last ditch effort, shooting one with an insufficient gun should never be done at all.